Trunks: Erect; bark gray to dark brown, fissures deep, ridges flat, blocky; wood light brown, hard. Twigs: Reddish brown or yellowish brown to dark brown or gray, rigid, densely stellate-hairy; leaf scars crescent-shaped; buds brown, ovoid, .12 to .24 inch, apex obtuse, scales sparsely pubescent. Leaves: Deciduous, alternate, simple; petiole .12 to .8 inch, pubescent; blade obovate to inversely triangular or elliptic in outline, 1.6 to 6 inches long, .8 to 4 inches wide, base attenuate to cordate, margins 1-3-lobed per side, lateral lobes oblong to ovate, spreading, distal lateral lobes and terminal lobe sometimes with 1-3 shallow lobes, terminal lobe similar in size and shape to distal laterals, sinuses extending 2/3 to 9/10 distance to midrib, lobe apex obtuse to rounded, not bristle-tipped, lower surface yellowish green, densely hairy with appressed-stellate hairs and scattered glandular hairs, upper surface shiny to dull dark green, glabrate or sparsely stellate-hairy. Flowers: Inflorescences staminate catkins at base of new growth, 20-30-flowered, pendent, 3.2 to 4 inches; peduncle .3 to .8 inch; pedicels absent; pistillate spikes axillary from new growth, 1-3-flowered; peduncle 0 to .16 inch; pedicels absent. Flowers unisexual, more or less radially symmetric; staminate: sepals 2-6, connate, calyx lobes .05 inch; petals absent; stamens 5-8; pistillate: sepals 6, connate, calyx adnate to ovary; petals absent; pistil 1; styles 3. Fruit: October; acorns, maturing first year; peduncle elongating to 0 to .24 inch; cup top-shaped to hemispheric, .28 to .6 × .43 to 1 inch, enclosing 1/3 to 1/2 of nut, scale apices closely appressed; nut light brown, ovoid to globose, .4 to .8 inch, glabrous or minutely pubescent; seed 1. Habitat: Dry, sandy to gravelly or rocky upland forests and woodlands, dry slopes, pastures. 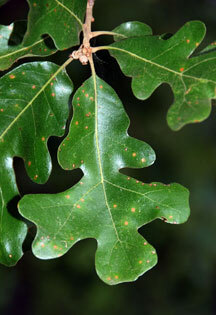 Comments: Perhaps the most recognizable feature of Quercus stellata is its cross-shaped leaf blades, though trees in some parts of the range do not bear leaves so characteristically shaped. In Kansas, post oak is most abundant on sandy soils.